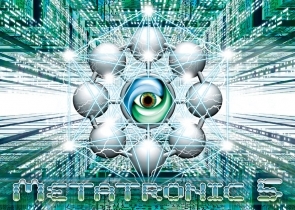 The Chilluminati Present, in our fifth year, our re-occuring one-night Psychedelic and Goa Trance event: Metatronic! This is an open-invite, full-scale music and art event taking place in Central Illinois. Amazing audio navigation from some of the best Live Psychedelic Acts in the USA, artwork and visual installations, kinetic UV performances, and more! Join us as we welcome the spring season and progress through Goa, Psytrance, Psychill, and PsyDM in an immersive & interactive environment by design. This venue is strictly 18+ with a dedicated bar area for 21+. Alcohol will be served until 12:30am only. Progress, the project of Yuriy Vaskevich, is an evolution of sound that brings a world of fantasy and imagination to its listeners. Based in New York City, an energetic hub, the music is a reflection of its physical origin as well as the mental evolution of its composer. With a strong foundation in classic music, mainly of piano and guitar and a post-modern ambition, the sound is both organic and electronic. The project began in the late 1990s with an exploration of personal identity and experimentation with various styles of electronic music. Today Progress ranges in style from psychedelic trance, ambient and chill-out, to avant-garde and experimental. Having played at several live venues in the United States and written film scores, Progress has a rapidly growing acclaim. As the name implies, the music is always progressing with the common denominator being its inspiring melodies and a strong tendency to take its listeners on a colorful journey. Co-founder of Dharmaharmony Records, Dragon is an international artist producing a hybrid style of psytrance and darkpsy. Learning to dj in 1997, he made the trek from progressive trance to the realms of psytrance by 2001, and started composing his own music around 2004. He has been a cornerstone of the trance scene in the South Eastern US, representing the TOUCH Samadhi coalition based in North Carolina. Dragon’s musical productions include a handful of singles as well as two full-length albums; “in.formation” released in 2009 and “spirals of time” releasing in early 2011. Dragon now has a new side project called “predator” which represents the sci-fi side of dubstep and continues to embrace his signature alien soundscapes that the Dragon project is so well-known for. The Dragon’s lair is in Gulf Breeze, Florida, the UFO capitol of the US, which may explain the heavy influence of all the interstellar sounds in his productions. The Primordial Ooze project was created by DJ’s Kaiser Soze and S.O.T. Flowing sounds that seem to bubble and evolve like primitive life forms. These bundles of frequencies collaborate in a swarm like manner, creating intelligent patterns and movement. The Ooze sound creates a unique twist on the ever changing sound of psychedelic music. The regulars know them and love them as their favorite regional live pa for psytrance to date, and their sound keeps evolving itself for every performance. Car0’s progressive sounds have been making waves all over the Midwest psytrance scene. Her uncanny style and passion for the psytrance culture has made her a great addition to the Metatronic lineup. Car0 has represented Chilluminati at several of our events, including the past winter series Microtronic, and has been featured on Chilluminati.Radio (Microtronic.2). Maxim Geht aka PsychoHazzard was born in Russia and moved with his family to Israel in 1995. it was there he was exposed to the psytrance music, that defined a point of no return for him. After partying for many years in psytrance scene he moved to the US in 2006 where he met The Chilluminati crew and there started his DJ path. For this short period of time he proved himself as a strong night time act with an onslaught of powerful, dark energy blasting from the speakers as your mind trips through the psychedelic landscape. He has since been playing all over the Midwest and has had determined success in his Moscow tour. In such a short time he has already shared the stage with some of the most talented artists in the scene today. So be prepared and straight jackets should be kept close by as the sounds of Psychohazzard are sure to take over your motor functions and is sure to be a highlight of the night. With over a decade of mixing experience, Kent Vogel has defined a very unique style of atmospheric drum & bass which is a perfect compliment to psychedelic culture. Having been involved in the electronic music scene for many years, he has made his sounds known all over the country. As one of Chilluminati’s favorites, the entire planet will soon feel the wrath of his chill iron grip. As an integral part of The Chilluminati Network, Koru continues to set standards. Her sound style is matched with some of the best in the Midwest psytrance scene. Incredible track selection + flawless mixing = pure winning. Koru’s talent not only rests with the music she plays, but also in her ability to create the environments that Chilluminati events thrive in. Energon has been involved with The Chilluminati for many events— playing the perfect sunrise, organizing huge deco installations, and overall event production. His morning-trance (full-on) style is a core component of what we stand for. He has had several mixes showcased on Chilluminati.Radio since its launch and serves as a staple in the Midwest psytrance scene for his melodic sounds. Ascension has been djing psytrance and psychedelic music since the fall of 2007. His love of powerful, high energy music is sure to warp your brainwaves into psychedelic euphoria. He has been working feverishly in the studio creating new, original tracks since 2009, and has released a handful of delectable samples. Dryerhose repair kit not included. Jean-Paul Paquette not only builds lasers from scratch, he’s a painter, and he paints with lights. Utilizing a computer controlled RGB laser, a number of really incredible intelligent lights and effects, he brings music to life for the dance floor. You may be wondering why a lighting company is considered an artist, but if you’ve ever seen one of his displays, you know that makes perfect sense. Teaming up with Jon Norling and Mike Underhill, the trio is known as High Voltage Lighting. Near the turn of the last century, video manipulation and montage in real time became possible on a desktop computer, opening up a new world of expression. PakaPaka Lightshow was founded by Jerome Fortier, Reuben Fortier, and Dale Kaminski, a trio of artists devoted to exploring this new media. Jerome and Dale saw that their decades of experience in creating analog psychedelic lightshows could be leveraged with digital computers rather than overhead, aldis, slide, and 16mm projectors. PakaPaka Lightshow congealed organically through contemplation on how to provide visuals for a “historical cabaret” theatrical piece about the culture and happenings of 1968. This unique event led to the opening of many strange and exciting paths and PakaPaka continues to wander them. With every performance, PakaPaka provides a new stream of optical amusements, empathically bonded to the vibration of the moment. PakaPaka Lightshow’s live video performance and multimedia explorations are represented via the label known as Psymbolic. John Hall is known for his abstract paintings and is from Chicago, IL. He studied at Illinois State University and has had various works featured in the ISU Gallery and student art shows. John also studied art at the Illinois Institute of Art in Chicago. Taking a break from art, in 2004 his first book, “Pandora’s Box”, was published – a fantasy/sci-fi novel. 2009 was a pivotal year in John’s career as an artist and currently John’s primary artistic focus is painting. John recently has been exhibiting works in Central Illinois and the Chicagoland area. The mission of John Hall Galleries is to create a personal experience for each viewer by delivering an impactful, high quality, original piece of art. The Gaian Eye Project does photography and other collaborative artworks. Through elaborate light painting techniques, and collages that capture traditional invisibility, The Gaian Eye team will warp your world’s fabric of space and time. This is an all-night, all-inclusive psychedelic and goa trance event located in the downtown Bloomington industrial district. Admission is restricted to ages 18 and up and there will be strict ID checks at the door. We encourage you to purchase pre-sale tickets to guarantee admission and to save a few bucks. Ticket pre-sales are being offered by Eventbrite. Absolutely NO UNDERAGE DRINKING, NO DRUGS, NO WEAPONS, NO DRAMA. THIS IS A LEAVE NO TRACE EVENT.This means that you are expected to pick up after yourselves and help us return the venue to its owners in the same, IF NOT BETTER, condition than it was before. Doors open at 7PM CST. You may be able to arrive early if you contact us ahead of time. Let us know what is on your mind. This is an indoor event with a dedicated smoking area in compliance with Illinois Public Act 095-1029. Buy tickets here to guarantee admission. Cost is $20 per person @ the door if still available! There will be running water that is safe to drink at no cost for the entire event. R.O.A.R. (or Right Of Admission Reserved) is in effect for this event. It is only through the participation of The Chilluminati Community we can make these events happen. We encourage participation on all levels, through any directive. Help us grow! -please do not park on the street. the parking enforcement in that area is very unclear, and while you won’t get towed for parking on the street, you might get a parking ticket. There are 3 parking garages nearby on Market St, Monroe St, and Front St. All are just a few blocks from the venue, and have free overnight parking. Use those to be safe. -Ins and Outs are allowed. There are several bars and restaurants nearby, as well as our favorite Hookah bar, The Smoker’s Den, which is one block away. There is also one of our favorite pizza/pasta joints right next door, Lucca Grille. We do ask that you make every effort to come prepared to stay. -We ask that you arrive before 8pm if you want to come early for the show before Metatronic. There will be no general admission between 800pm and 930pm. This is to minimize incoming traffic to the venue and to be respectful to their show beforehand. -Alcohol sales are over at 1230pm at the venue. THERE WILL BE NO ALCOHOL FOR SALE AFTER THIS TIME. -We can always use help with setup. Please contact me directly if you’d like to come out tomorrow, Friday. Any other questions, please have your people contact our people. See you all this weekend! -Psychedelic trance, chill and ambient are the music that we play. Music in itself is a transformative and psychedelic agent. -Our gatherings are more than music. They are multidimensional, multifaceted trance, visual, art and kinetic performance events. They are experiences, a psychedelic circus. -Our gatherings are about transformation and becoming. Whatever your sense of spirituality is, you bring that to the event. -At our gatherings everyone takes responsibility for the event, others and themselves. -Our gatherings have an atmosphere and a vibe. The event is a field of energy that connects us. The event is a living being. -Our gatherings are about expressing yourself, being creative, being an individual. -Our gatherings are inclusive and open. -Our gatherings are both local and planetary; cultural diverse, reflective of the American Midwest, yet global. -We respect local laws and customs. -Our event is a gift which we all (organizers, artists, DJs and attendees) give to each other. This is not about money, commercialization and exploitation. This is not a product this is a community. Metatronic 5 is an 18+ event, with ID REQUIRED.